For years, Lincolns PowerLuber has been the favorite of technicians, mechanics, maintenance crews, farmers and others for almost every lubrication and preventative maintenance task imaginable, from the automotive, trucking and fleet industries to everyday applications in agriculture, construction and industry. Now, Lincoln has made the best even better. PowerLubers versatile two-speed design gives it the capability of two powerful tools in one. At the touch of a button, it can deliver high volumes of lubricant at medium pressure or a concentrated stream at high pressure (see specifications below). Lincoln has added a built-in stroke indicator to make it easy to measure total output. 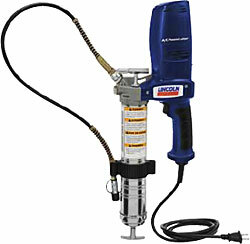 New from Lincoln...a grease gun with the highest torque values in its class! 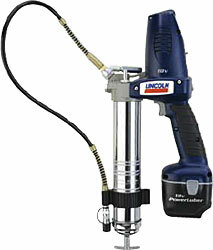 The newest addition to the popular PowerLuber family of cordless grease guns. 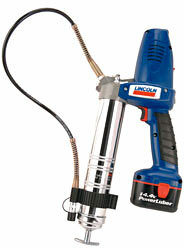 Lincoln's new, heavy-duty 14.4 Volt PowerLuber gives you the power to lubricate just about anything, anytime, anywhere. All the features you need, including comfortable grip and balanced design; hook for shoulder strap; built-in hose and coupler holder; and a slim, compact carrying case. The long-lasting, high amperage 14.4 volt battery lets you work longer between recharges. When you do need to recharge, our high-tech Smart Charger does it inless than one hour. The Smart" Charger even recognizes battery condition when not in use, and keeps your battery ready to go. The 14.4 V PowerLubers balanced design and padded grip make this tool comfortable and easy to use. Battery Charger Model 1410 - 14.4 volt and 18 volt "Smart" Charger recharges batteries in just one hour, and keeps them at full charge, ready when you need them. Shoulder Strap Model 1414 - Shoulder strap enables hands-free movement from job to job.